Travelers have for many centuries made their way along trails, and now on asphalt ribbons, pausing to rest both their animals and to refresh themselves. The rest areas along routes between villages, and even countries, were simple stops alongside streams or water wells, but entrepreneurs have found ways to make them more enjoyable. Along roads, highways and expressways, road stations are increasing, with business and government teaming up to provide quality road stations. Once Spartan rest stops, today’s roadside facilities have molded themselves to meet the diverse needs of an ever-increasing driver population, including women and elderly citizens. The Ministry of Land, Infrastructure and Transportation’s Road Bureau jumped into the design side, wanting to create facilities that provided for safety and smooth traveling. As officials eyed various spots along highways, local citizens began talking about sharing their culture, history, local products and local information. With that, a new era of road stations was born. With the Road Bureau setting standards for facilities and services, plenty of parking, clean toilets and telephones, guides or facilities for sharing local area information, and insisting facilities should be barrier free to serve the handicapped, modern road stations were designed. 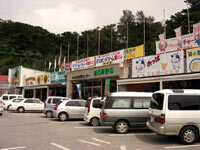 The first road station was established at Yamaguchi, Gifu and Tochigi Prefectures in October 1991. Across Japan, that number has swelled to 868, with five registered in Okinawa, The officially registered locations are Kadena, Ogimi, Kyoda in Nago City, Kunigami and Kina Bansho in Yomitan. There’s also an Onna Road Station close to the Ramada Renaissance Hotel, and several others on Okinawa, but they’ve not been officially certified. 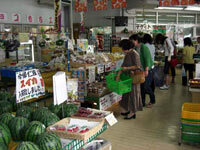 Local road stations are popular shopping destinations for local produce, and more importantly, perhaps, fresh donuts. 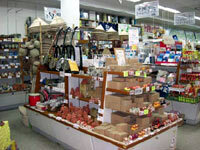 The Kyoda road station inNago, just after the Kyoda exit from the Okianwa Expressway, is famous for its sata andagi, Okinawan donuts. They come in several varieties, all fresh, some even still warm. Alas, they’re typically sold out by early afternoon each day. Kyoda’s also well known for being a lucky road station; several Takarakuji, lottery tickets, purchased there have scored ¥100 million or more, leading many to make the pilgrimage north just to buy the lottery tickets. Hard as it is to fathom, there are even people from outside Okinawa Prefecture who make the local visit just to purchase lottery tickets. All road stations have restaurants serving soba and other local foods. The unregistered road house in Onna even has fresh fish in tanks. All road stations offer fruits and vegetables.